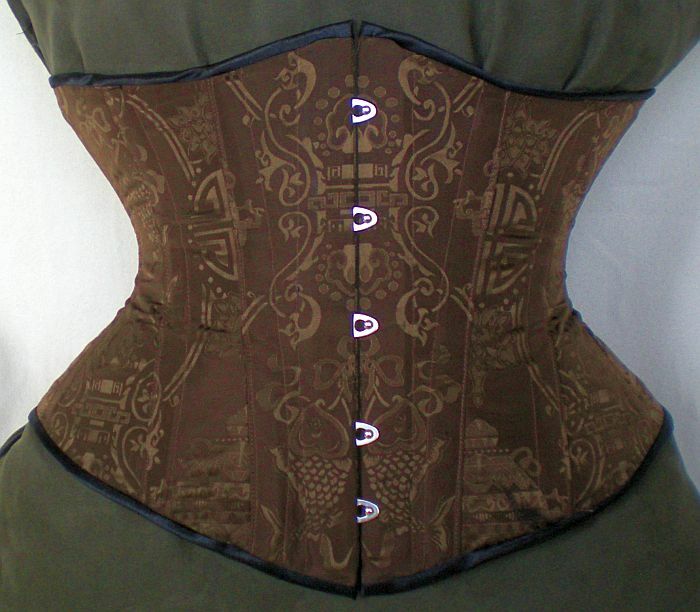 This post is for Alexis from Electra designs corsetry. She asked on facebook to see some of my corsets and I am terribly pleased, and although I am in America at the moment and have only 4 corsets with me and no dress form, I decided to go for the cushion option: Get a big cushion, and tie your corset around it and you get a reasonable, not great, but reasonable approach to how it looks. So I have been working on making corsets. I am still working on utter perfection though. 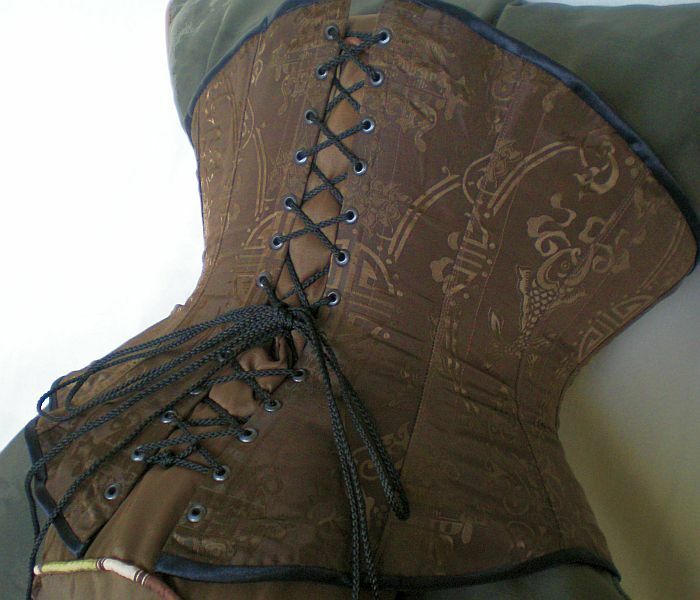 So here is my first corset. I’ve been wearing it a lot, and I still like it. I have already worn out one corset lace on this one. I made it from a pattern, which was published in a dutch magazine, La Gracieuse in 1880, and ”adapted to the modern figure”. Which is where it goes wrong, because I don’t think I have the modern figure. Anyway, while making it I already adapted it a bit, so it’s not exactly following the pattern after all. It is made of denim (!) not coutil, fused onto the curtain fabric which is the outer layer. It hasn’t stretched yet. It has a wide busk and spring steel bones. Because I happened to have them hanging around. 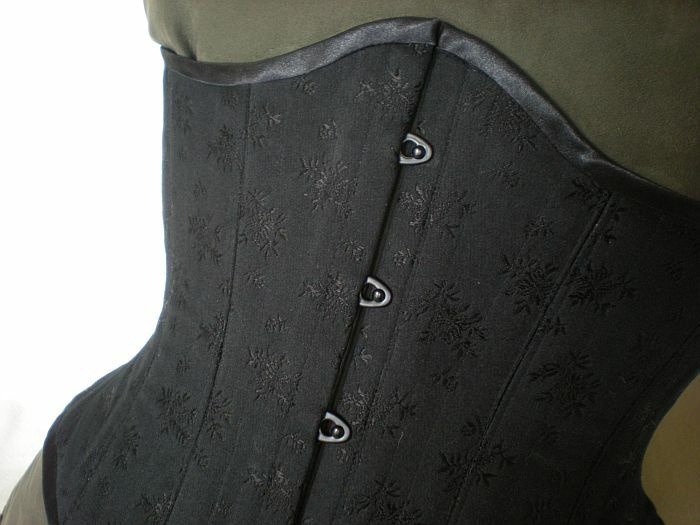 I still wear it quite often because it is a great corset and makes me a lot more comfortable when I have my moon-time. I think it cuts down on my painkillers by about 50%! The spring steels make it a bit heavy, but it’s greatest drawback is that it doesn’t allow enough space for my hips and my bum, after a few hours that starts to irritate me. 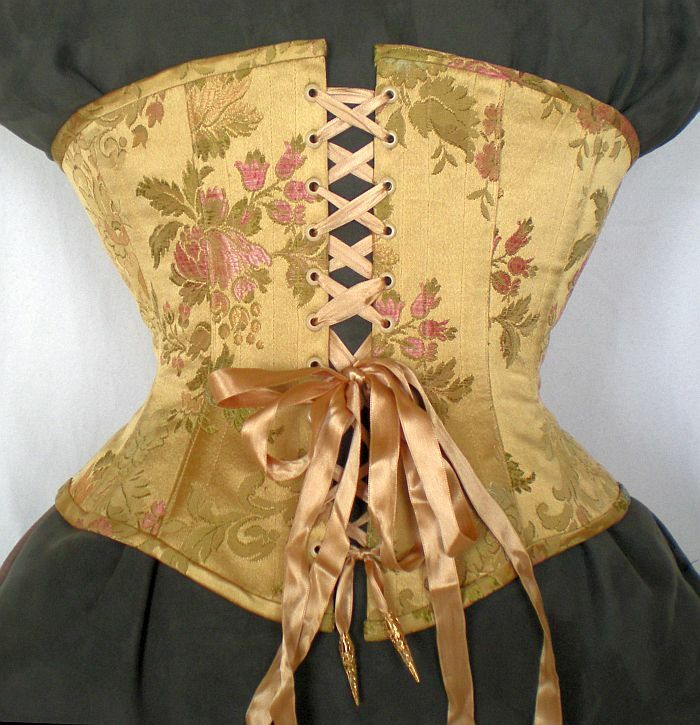 After making this corset I was hooked and kept dreaming of more. So then I started experimenting a bit. 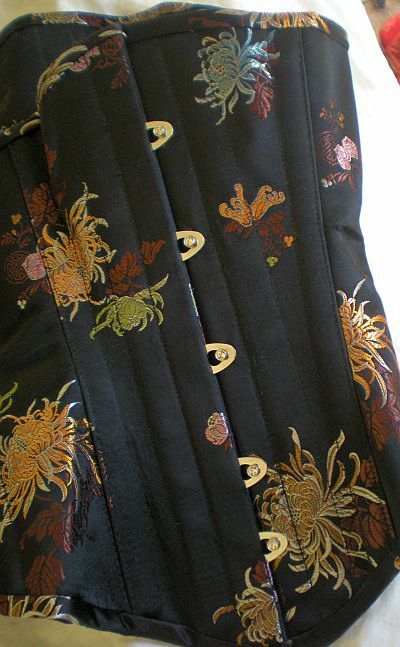 This is my #3 corset, made of coutil inside and Boutonniere Broche on the outside. So two layers of proper corset material. I have been abusing wearing this corset a lot! The idea behind this corset is to have more space for my hips and bum (btw, it was not enough) an hourglass waist, and lots of space for my ribs, (actually too much), so I can have full use of my lungs while cycling. Because while you normally don’t notice anything, if you are, for example cycling up against one of these very steep bridges in Amsterdam, you notice you are restricted by a corset. 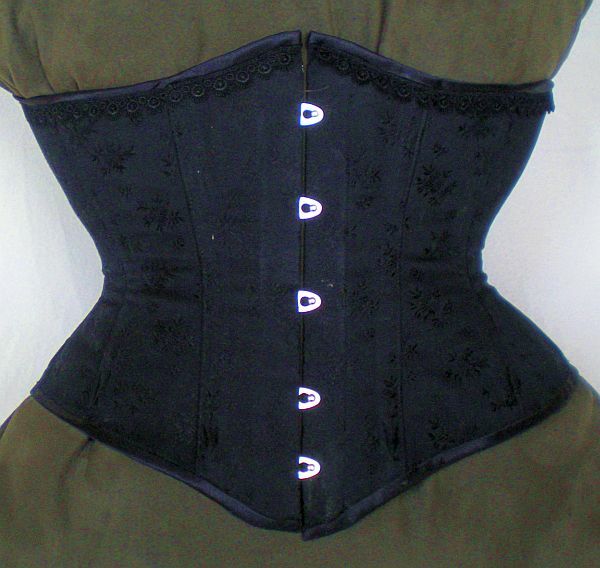 This corset is made with single 7mm boning which is a bit too light. (#2 was made with single 11mm) One time I was bored and tried my hand at a bit of flossing. All bones are flossed on this corset. #4 corset turned out to be incredibly wasp waisted, a bit too much really, I don’t waist train. It is more of a waspie, I used a smaller busk, with swarovski crystals in the little nobs, really pretty and very sturdy. 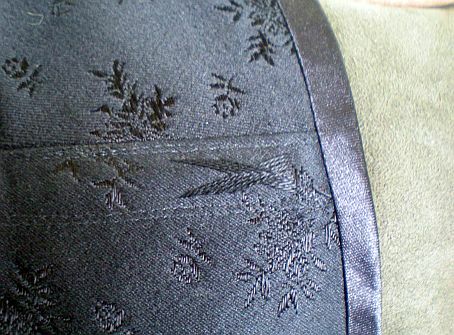 It is also the first corset where I made the bias tape myself from the same fabric. I then made two corsets, at the same time, I call both of them #5, with the same (altered again) pattern. I needed to get rid of that extreme wasp waist. One is at home, made of lovely velvet and coutil, and this one, made of a vintage fabric I have had since I was in high school and never dared to use for anything because I love it! now an underbust corset doesn’t take a lot of fabric so this is the first time I used some of it. I had a busk with gilded hooks and knobs, very pretty, and spring steels next to it for stiffness. The other bones are 11 mm spiral steels. 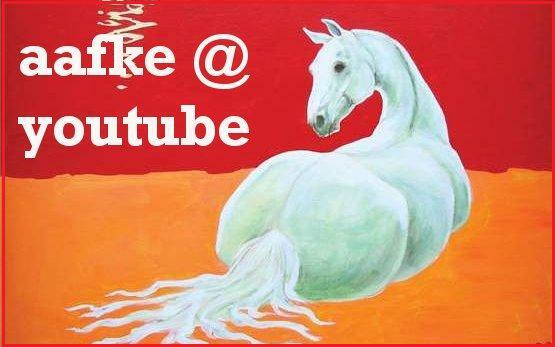 The inside is of white coutil. Showing the back to show the nice creme rivets (in a steel lacing bone). And the ribbon, This is the only corset I close with a ribbon instead of a lace, or my favorite: a good looking black nicely woven thin rope from the hardware store. #6, Black coutil inside and the black boutonniere broche on the outside. this one is supposed to be for comfort, with finally enough hip and bum space (at last!) Double boned with 11mm spring steel, which I think is overdoing it a bit. next time I will use the 7mm spring steel boning. Very nice black powder coated busk, which I again paired with spring steel bones. Forgot the waist tape again! We’ll see how that works out in this very heavily boned corset. The black busk. I will abuse this one a lot to find out how sturdy that powder coating actually is! The fashion fabric was pretty but nasty to work with, very thin, frayed a lot, and as you see it’s rippling! Which makes this corset unacceptable. I might make another one, because I love the fabric (it’s inside out btw, because I liked that even better) and fuse it. I had prepared the strips of fabric to make bias tape, but I wanted it for my trip so made do with commercial bias tape. I always like a black border anyway. The back, laced with my favorite lacing: the rope from my hardware store. Dead cheap, and it doesn’t slip when lacing up, and pretty! A bit too short, so I didn’t lace the last rivet. These are burnished brown. 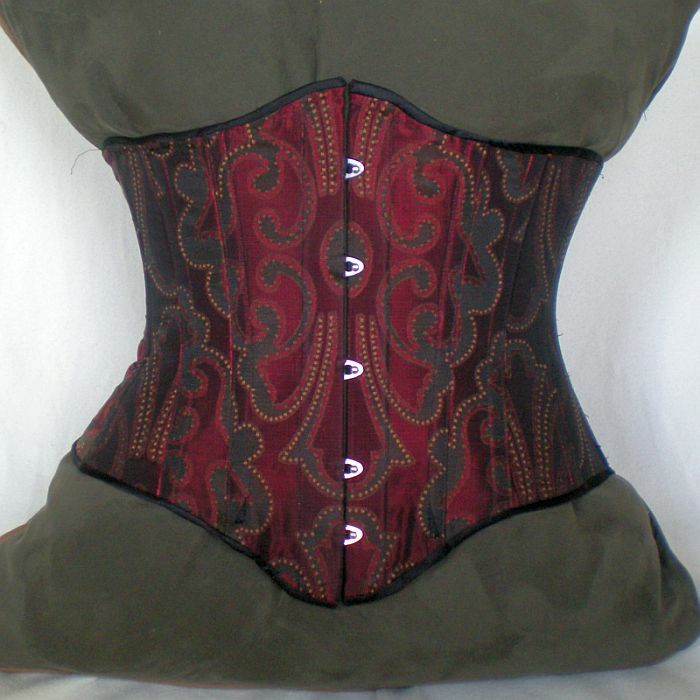 May i ask where about you purchased, your corset pieces from ?? 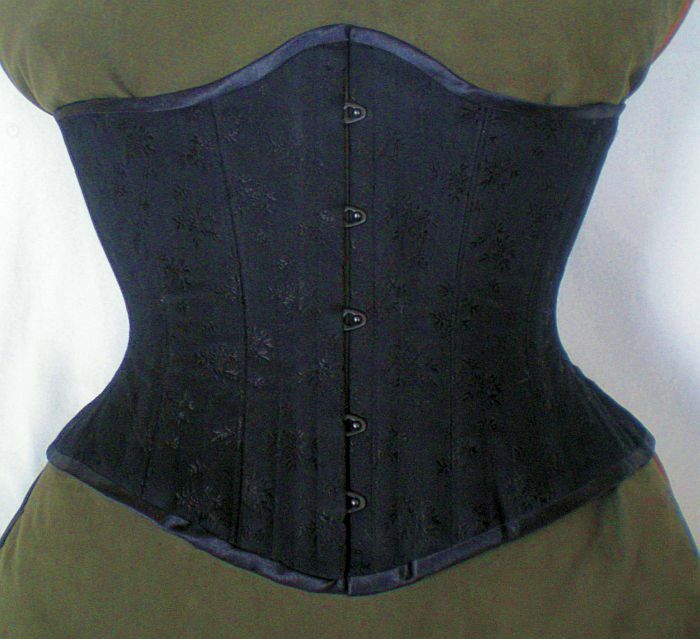 I buy my corset materials from Vena Cava and The Sewing chest, both companies are based in England. The fashion fabrics I buy on markets mostly, we have some pretty good cloth markets in the Netherlands. 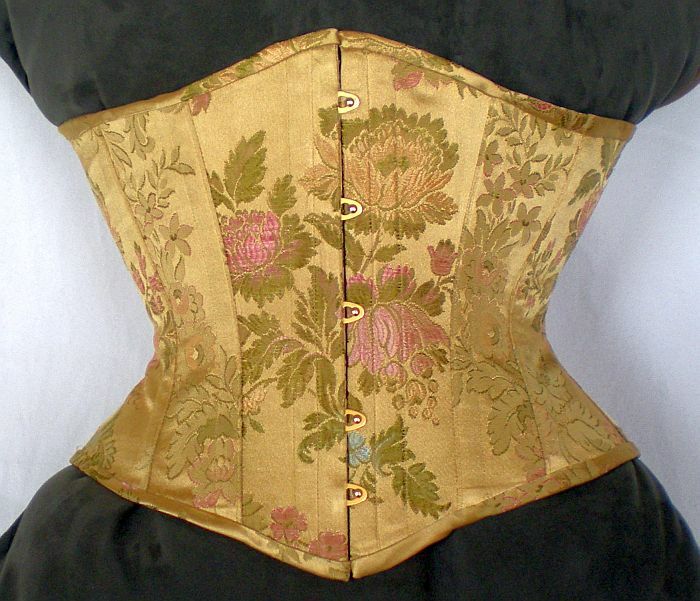 I stand corrected, i reread the article, as you yourself design and process your corsets, say i was interested in reviewing your work, what would your answer be?